Music, beer, food, guaranteed merriment -- head south for this don't-miss summer festival at Sprague Farm & Brew Works. Summer solstice is the scientific way to mark the start of Erie's sun-soaked days. However, it's the endless stream of music that flows through festivals, block parties, and sidewalk patios that truly opens up the season. But with each waterway leading to Erie's warm shimmering lake, its southern stomping grounds can seem to be left untapped. Fortunately though, WQLN and Sprague Farm & Brew Works have tapped into the spring of summer jams, fine art, good food, and craft brews, as they present the 3rd annual Crawford County Music Festival on June 29. "There is this idea in Erie, that if you're going to go to a summer event you go right to the lake front. But the theme, the spirit, of the Woodstock -style concerts was to get away from [the city]," says Tom New, president and CEO of WQLN Public Media. The concept of heading south – when the lake's rolling waves are beckoning us to come north – is a tough sell, indicated by a decrease in ticket sales between the first and second year of this festival. However, this summer, WQLN has changed directions, reaching out beyond regional lake-trolling musical acts, and pulling from bands that are sure to set the crowd on fire. 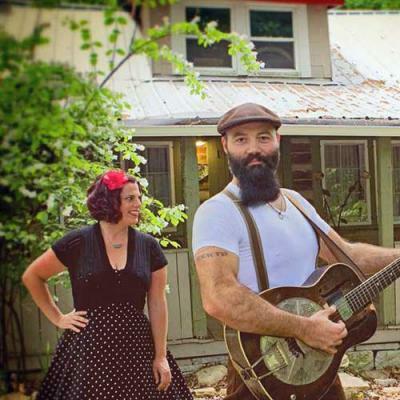 Headlining this year is The Reverend Peyton's Big Damn Band. They're coming up from Brown County, Ind., to help foster this "Woodstockian" atmosphere and replant some forgotten festival roots. This prolific three-piece pumps out music like a fire hose; except the water in the rubber tube is more like gasoline. In support of their seven albums, the band delivers a powerful live performance with Breezy's unabashed energy on washboard, Bird Dog's folk-rock beats, and the rustic, elegant, thump of Rev's guitar that will ignite the crowd. Right behind the Big Damn Band are returning reggae-rockers, The Folkadelics. Although these guys and girl are from the East Coast, all their sound seems to be influenced from the West. Their album carries strong over tones of Sublime, Slightly Stoopid, and even No Doubt — especially when female vocalist Danny Faraone is on the mic. Because of The Folkadelics' stellar performance last year, they're coming back to do it all again. "[The Crawford County Musical Festival] was one of the best experiences ever," says Gavin Cummings, vocalist and mandolin player for The Folkadelics. Coming from the concrete prism forest of New York City into Pennsylvania's lush green woods, Gavin can't help but look forward to the change in scenery. "It's our favorite [festival] of last year, and it's definitely the one we're looking forward to the most this year." While WQLN did veer into uncharted water with Rev and his gang, they didn't forget about some local favorites. The line-up also included multitasking Tom Stine, the mountainous sounds of The Tiger Maple String Band, and a heartfelt, almost-local Pittsburgher Nancy Deckant. The Crawford County Music Festival is more than just a watering hole for musicians. The festival is bringing in artists of all media including fabric artists, potters, carvers, and chair caners to share their art and even teach their trade. Along with the thirst-quenching spring of music and art, you'll also get to tip back some smooth craft beer from Sprague's; grown, brewed, sold, consumed, and returned to the earth all on the same idyllic sylvan setting. And festival goers can soak up a belly full of brew by gorging on a variety of available grub, ranging from American barbecue to Asian cuisine. It is true that beer can be an all mighty motivator for acquiring a ticket, but if you're a younger festival lover, you're still in luck. Those under 18 get in for free, reason being, "There is something kind of neat about mom and dad bringing the kids out to see some rock 'n' roll," Tom says. While the sirens of the lake are always alluring, this festival's fresh new music, cool crafts brews, and Appalachian-style art should make you take a second glance southward and head on down to the Farm.